Reel-Scout has always been proud and happy to call Charlotte our home. We’ve built our companies here. We’ve raised our families here. We love most every nook and cranny of this city and there are too many other places we’d rather be. But putting aside all the personal reasons why we love Charlotte, did you know that the Charlotte region is also the setting of blockbuster movies such as Shallow Hal, Nell, Days of Thunder, Talladega Nights: the Balad of Ricky Bobby, and The Color Purple? In addition to major movie studios, Charlotte has also lured many small independent films and television productions to its door, among that list are America’s Got Talent, Biography Channel, Dawson’s Creek, ESPN, Food Network, HGTV, History Channel, and Travel Channel to name a few. Major television networks, such as CBS (WBTV), ABC (WSOC-TV), NBC (WCBC-TV), FOX (WCCB-TV), The CW (WJZY-TV), and PBS (WTVI), have long established offices in Charlotte, and commercial production companies are even more enamored with our city. Hundreds if not thousands of commercials have been staged and produced in Charlotte by companies such as Garage Films, Getty Images, Big Fish Films, and O Magazine. But best of all, according to the latest report by News 14 Carolina, Charlotte’s and North Carolina’s revenues have increased exponentially not only from partnering with the film industry, but especially from working with video production and distribution companies. Based on a study by UNCC Professor John Connaughton available from the Charlotte Regional Partnership, this niche industry alone has helped Charlotte’s economy grow leaps and bounds in 2008, bringing in approximately $470 million for the city and creating over 2,400 jobs for Charlotte and its neighboring counties. 2. 25% Film Incentive – Starting January 1, 2010, productions spending over $250,000 in North Carolina will receive a 25% tax credit on in-state purchases for good and services – not to exceed a credit of $7.5M per project. 3. Accommodation Tax Refund – When staying in North Carolina, productions receive a refund and cessation of taxes on rental accommodations of 90 days or more. 4. Uniquely Talented Labor Force – Charlotte has been well known for its extremely talented pool of film and production professionals. For a list of Charlotte’s 2009 Film Production Directory, downloadhere. The folks at Reel-Scout are proud to call Charlotte home and have no doubt that Charlotte will continue to be a popular location for productions of all kinds. If you’re ever in town, come visit us and we will give you a personal tour so you can see for yourself what the big fuss is all about! For a list of movies filmed in Charlotte and North Carolina, visit the North Carolina Film Office’s website. 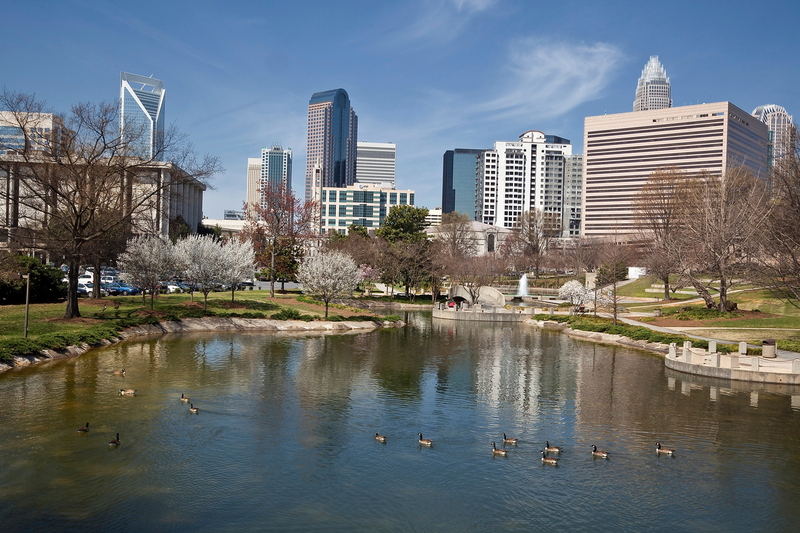 Banner image of Charlotte, North Carolina via Google.